Concrete floor finishing tastes are surprisingly subjective. However, strength and performance characteristics are beyond question when concrete slabs are properly installed. 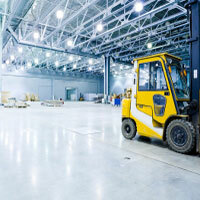 Professionals choose designer finishes to dazzle with color and light reflection while warehouse tenants choose concrete for its resilience to forklifts and work boots. Individuals may opt for the beautiful, buff-polished beauty of bare concrete flooring. Hold those horses. That buff comes with maintenance for those who want a glossy shine. Installers who polish before the floor is dry are haunted by the shine of persistent moisture problems. End results reflect the integrity of the process that created them. Definition: the process of finishing concrete to provide a hard-wearing, durable finish with a surface luster. The goal of burnishing is to produce smooth, impervious and durable concrete surfaces free of residual trowel marks. The concrete grinding process utilizes a diamond grit set in a metallic matrix to remove pits, blemishes, stains or light coatings from the concrete surface. Depending on the coarseness of the concrete, “grinding” occurs in three or four stages. The purpose is to take the rough out of the slab. This is the first stage of a polished floor. Next, concrete polishing sets finer diamond abrasive in plastic or resin polishing disks. Installers set those disks in motion, gradually moving to finer and finer abrasives to bring more polish to the floor. The process of “lapping” continues until the concrete floor shines as desired. During polishing, installers apply an impregnating sealer which densifies and protects the concrete. The impregnating sealer may negate the need for a topical coating, but contractors sometimes apply a commercial polishing compound to bring more sheen to the fore. From first to last, burnishing seeks to refine the rougher surface, which is typical to new concrete slabs. Troweling smooths the surface, grinding removes unwanted dirt and materials, and polishing seals the job. It is vital to distinguish between a concrete surface and the chemical membranes that seal it. Sealers are designed to protect concrete slabs from corrosion by blocking surface pores which absorb moisture and salts. Moisture permeation has several possible sources: chemical intrusion, freeze/thaw, and corrosion of reinforcements. Once a sealer is applied, it forms a thin layer between concrete and its surrounding air. Moisture is part of concrete from the moment that Portland cement, water, and aggregates are mixed. During the drying process, this moisture migrates to the surface of the slab to evaporate away in an ongoing process until the slab is sealed or has reached the same level of relative humidity (RH) as the ambient air. Concrete problems related to moisture ensue when installers have not allowed sufficient time for moisture to leave the slab. 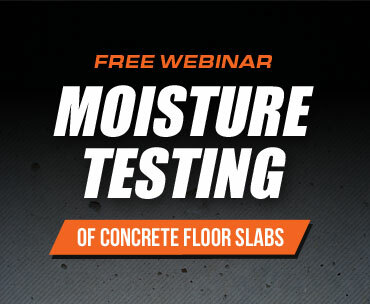 Excess moisture creates residual problems which can jeopardize concrete flooring, no matter how it is sealed or finished. The burnishing process can exacerbate moisture-related problems if slabs have not dried properly. Put simply, the sealers whose purpose was to make concrete floors resilient and shiny end up trapping water vapor inside slabs. Left without a means of escape, concrete moisture sits. Burnishing sealers may fail, along with flooring adhesives and chemical colorants. Excess moisture shouldn’t be there, but it is, and builders and customers face expensive concrete remediation. The best course, of course, is to be sure the slab has completely dried to the necessary moisture level. Surface-based testing, like calcium chloride (CaCl) testing or using hand-held concrete moisture meters, can only identify the need for a quantitative measure. RH testing, on the other hand, provides a complete picture of a slab’s moisture condition with the use of in situ probes placed within the concrete at 40% of the slab depth. 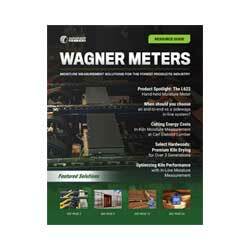 The Wagner Meters Rapid RH® measures RH inside concrete slabs for a complete picture of the slab’s readiness to begin the polishing process. 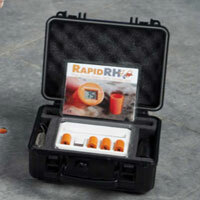 The Rapid RH® in situ RH test system provides crucial information on when installers can safely proceed. A concrete moisture meter brings shine to slab integrity and performance, as polishing does to concrete surfaces. Just had a customer that did not perform a moisture test prior to using our acid & oil repellent. Moisture absorbed into our product.As a result the project had to have a restoration & installer refused to admit fault of not performing moisture present test & blamed our product instead of admitting installation error. I am remodeling a house with a concrete slab. There was old linoleum tIle covered by carpet. One day the temperature dropped to around 0 outside. The next thing I know much of the carpet is wet. We pulled it out and there was visible moisture under the linoleum tile although it very quickly evaporated. We had the roof and mechanicals checked for leaks and none were found nor was any water damage apparent or visible. No dripping. We had a floor sealer come in an inspect and was stumped. He thought it was a roof leak but admitted it was strange no sourse was visible. We talked with a plumber who had us check water usage over a weekend when no one was there in case a pipe was broken but no water was used at all and the moisture had not returned. Everyone is stumped. There was moisture where ever something like carpet or a card board box was on the floor in a number of rooms. Is this the slab sweating? If so, can it be sealed to prevent this happening again? It sounds like you may be having a condensation issue due to the drastic swing in temperature. You would need to look at interior ambient temperature and relative humidity along with the surface temperature of the concrete and calculate dew point to see if that may be the culprit. If this is the problem, sealing won’t help. Now, if the slab has no intact vapor retarder under the slab and this is why the moisture is present, then SOME topical products will help. I would have someone do a core sample of the concrete slab to verify if there is a vapor retarder underneath. This would be a good place to start. Good luck. I didn’t know that the goal of burning was to make the concrete smooth. My husband and I were considering adding concrete floors to our home gym. I think we are going to try and find a contractor to come in and help us with this. I’ll be sure to keep this in mine. 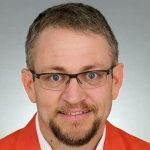 Great article, it really pays to know the right information so you can ask the right question whenever having contractors do work for you.